You can probably already tell that those three asterisks behind that F represent the F-word. Despite its derogatory connotation, it's worth looking into some of the different ways that GTFO might be used. As an emotional expression of shock, disbelief or indignation. GTFO is a variation of the phrase, "get out," which contains the F-word for added emotional intensity. Other comparably vulgar acronyms that makes use of the F-word for added intensity include CTFU, CTFD, BTFO, KTFO and JFC. When used in a serious sense, GTFO is nothing but harsh and often insulting. Sometimes, however, GTFO is used in a humorous way to emphasize a person's overreaction to something minor or trivial. Friend #1: "You can't tell me when I can or can't be in our apartment. We're roommates who split rent 50/50. I can be there whenever I want!" Friend #2: "I don't care, you need to GTFO this Friday so I can bring my date over and actually have some privacy!" In the first example above, GTFO is used in a demanding way to tell someone to leave. Friend #2 doesn't want Friend #1 to physically be at the apartment they share together. Friend #1: "He didn't even say sorry or goodbye! He just left and I haven't heard from him since..."
Friend #2: "GTFO! I never would've expected that behavior from him. Thought he was actually one of the few nice ones out there." In this second example, GTFO is used to express shock or disbelief, similar to how an individual might react with, "No way!" or "I can't believe it!" Friend #1: "Almost just got caught by my manager trying to nap in the warehouse behind a pile of boxes. Had to GTFO when he turned around and wasn't looking..."
Friend #2: "Oh man that's too funny!!" In this third and final example, Friend #1 uses GTFO to exaggerate their urgent need to physically leave a specific place, which adds a humorous touch to the event that they described. GTFO is one of those acronyms you have to be very careful with using. It can be very insulting depending on the context in which it's used and how the person or people on the receiving end decide to interpret it for themselves. 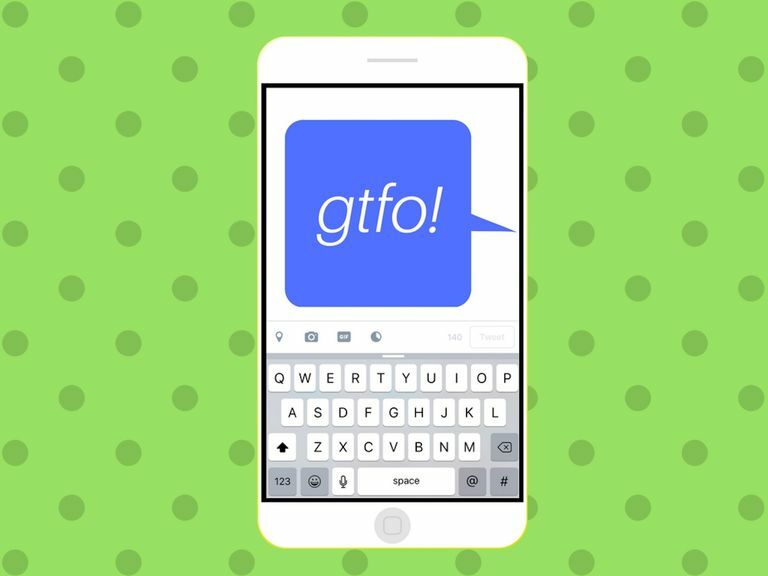 Unless you're joking around with your friends by using GTFO in a very obviously funny way, using GTFO is likely to turn people off from you and push them away. Keep this in mind if you plan on adding it to your online acronym vocabulary.